Marriott Hotels Manila recently joined the more than 3,400 Marriott hotels in 69 countries worldwide in a feast for the record books. Thailand's top chefs have created an exotic menu that they have served last 20.10.2010. 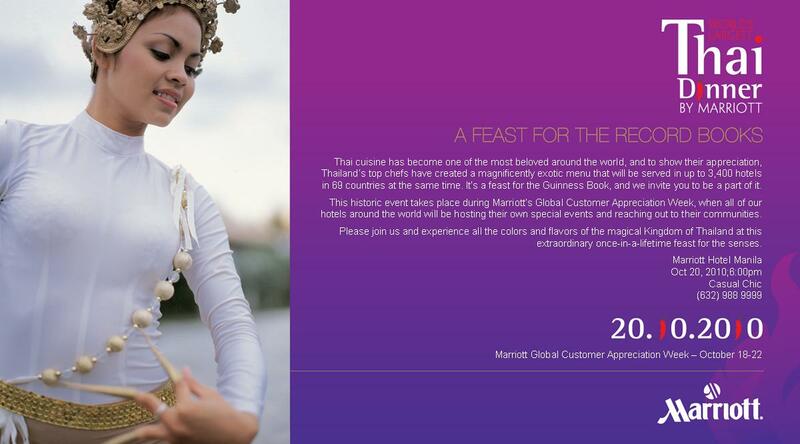 The “Worldwide Dinner Event” took place during Marriott International’s customer appreciation week, allowing Marriott properties across Asia, Europe and elsewhere to say thank you to its best customers while treating them to a dinner bursting with flavors and a gift box filled with favorite Thai recipes. The coordination in having the dinners occur simultaneously allows Marriott to compete for the world record. Thai food is very popular all over the world, may it be the Americas or the European countries, almost all continents have Thai food as part of their daily palates. Just goes to show how spice can make the world go round. And if the world runs out of red chili, you would know what country would suffer most...not because they are out of food, but because they can't eat their food without chili. Now that's one big predicament. Just look at all the spices that go in the dishes.....hot!!! Marriott International hotels around the globe are serving up tangy Tom Yum Goong (lemongrass soup) and savory Pad Thai noodle on October 20, 2010 to thousands of customers, associates and officials in an attempt to break the Guinness World Record by hosting the world’s largest Thai dinner party.